On Friday I posted a picture of Victoria Regia granite and ended up getting quite a few emails asking about it. 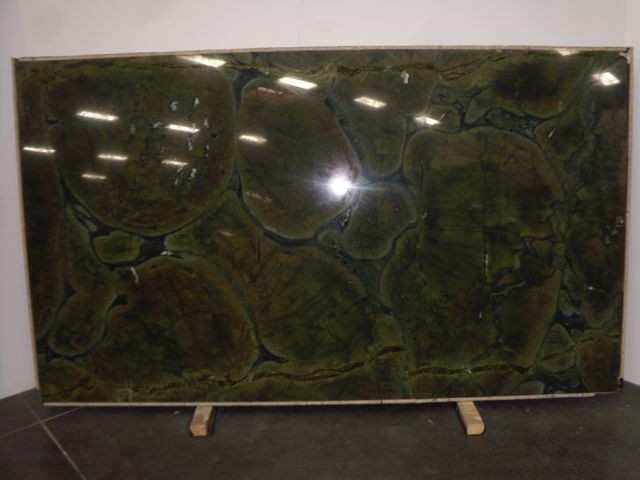 Here are more pictures and information about this beautiful stone. Victoria Regia is quarried in a bedrock quarry in Brazil. From the picture above doesn't it look like an aerial photo of a rain forest or something? I think it's such an amazing stone. The unique pattern in this granite is because it was formed while the minerals were in a liquid state. Slowly being cooled and with intense pressure, the minerals formed the circular lily pad design visible in the slabs. Some slabs will have more "lily pads" while other slabs are a bit more linear. Thus the name. Vitória-régia is a flowering water lily named after Queen Victoria. You can read more about the lily here. Above is a photo of the current stock of Victoria Regina from our supplier Adamas Stone. Other names for Victoria Regia include: Vitoria Regia and Victoria Regina. Victoria Regia is also really pretty with a Satin Finish and with a Honed Finish. I've seen a lot of suppliers now stocking it with the Satin Finish or you can have your fabricator put these finishes on it. It's hard to tell, but in the photo below the granite has a Satin Finish on it. Check out this stunning bar. They put lighting under the wood countertops and then used the Vitoria Regia on the panels. Another stunner is this custom made bathroom sink out of the Victoria Regia. I like that they made the sink nice and big and put faucets on both sides. Victoria Regia is available in 2 cm and 3 cm slabs. Wow these pictures are beautiful. With my husband I bought a kitchen that has the same backing board such as this the second or third picture if I am not mistaken. I see perfectly well that you are a lover of Silestone. Silestone ... this is right? I found one online company that is engaged in various projects - MAG Projekt GmbH - http://www.mag-projekt.de. I think they just use granite as a material. I looked at pictures on their website and was really nice just like on this blog. Times change and so the quality. Congratulations to all of these manufacturers. This last picture I especially liked ... I would also like to have a kitchen in the outdoors.